(Newser) – Ben Carson is Donald Trump's pick to run the Department of Housing and Urban Development. The president-elect made the announcement Monday morning, praising the retired neurosurgeon's "brilliant mind," reports Politico. "We have talked at length about my urban renewal agenda and our message of economic revival, very much including our inner cities," said Trump. 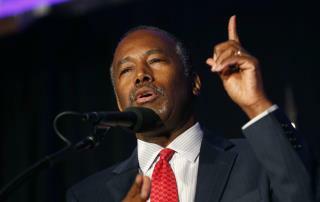 Carson, 65, has never held public office, but he has said his own experience growing up in poverty in Detroit would give him insight into this role. In his previous public comments on federal housing, he has criticized the Obama administration's efforts as "social engineering," notes the New York Times. In particular, he wrote an op-ed last year criticizing an anti-segregration rule and comparing it unfavorably to federal busing. I feel that Trump is waiting for us to wake up. He doesn't want to be president. In reply to Brushman again: I wholeheartedly believe you will be pleasantly surprised with how efficient and capable all people in Cabinet and other posts will prove to be! !